AICN COMICS Q&@: Russ Sheath talks to the IDW LIMITED team about their 1st Anniversary plans! AICN COMICS Q&@: Russ Sheath talks to the IDW LIMITED team about their plans to celebrate the companies 1st anniversary & how you can win a very special prize! Jerry Bennington & Nate Murray!!! Russ Sheath here, and I've got to say that IDW Limited are pretty unique. You only need to look back over the last years output of fan favorite projects to realize that what IDW delivers are limited edition, must have projects from the very best of creators across comics. 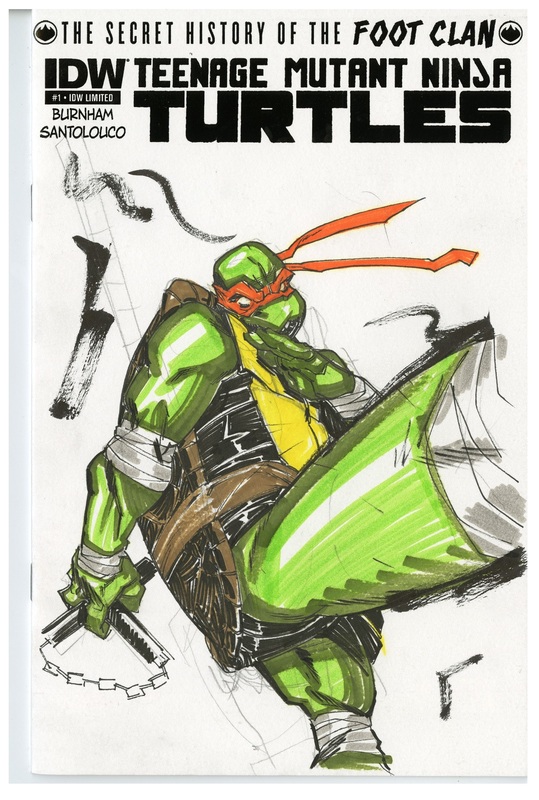 From limited edition slipcase editions containing sketches from some of the best comic book creators in the industry to gallery quality portfolios of iconic artwork - IDW LImited really know how to pull something special out of the bag. 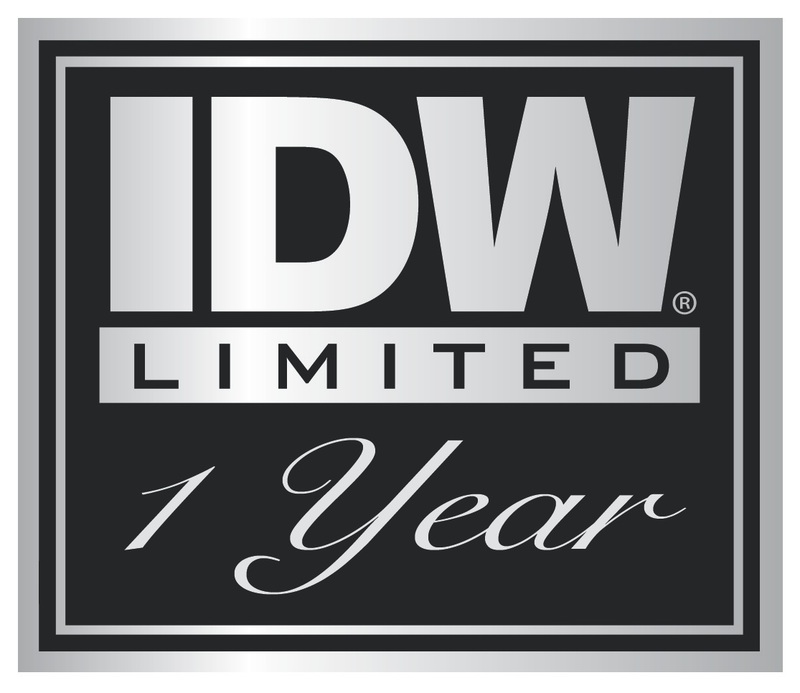 You only need to look at the list of properties and creators that IDW have worked with; TRANSFORMERS, GI JOE, JUDGE DREDD, DOCTOR WHO, STAR TREK and TEENAGE MUTANT NINJA TURTLES name but a few of the properties that have recieved the IDW Limited treatment. With creators such as Darwyn Cooke, Brian Bolland, John Royle and Carlos Ezquerra providing highly sought after content together with industry legends such as Herb Trimpe and Russ Heath. This week IDW Limited celebrates its anniversary with a 72 hour sale and a several giveaways, I sat down with IDW Limited's Jerry Bennington and Nate Murray to talk about what it takes to bring these must have projects to comics fans, their plans to celebrate the first year of IDW LImited and their plans going into year two. And be sure to check out the bottom of this piece to learn how you can win a special prize featuring one of comics most iconic properties featuring art by its creator. RUSS SHEATH (RS): IDW Limited is heading towards its first anniversary - how' that feel? JERRY BENNINGTON (JB): It's been a great year. Very rewarding. The entire team has worked very hard to deliver unique books that would the definitive treasured piece in a collector's library. I'm shocked that it's already been a year since we launched our first IDW Limited release, TMNT: Change is Constant Limited Edition. 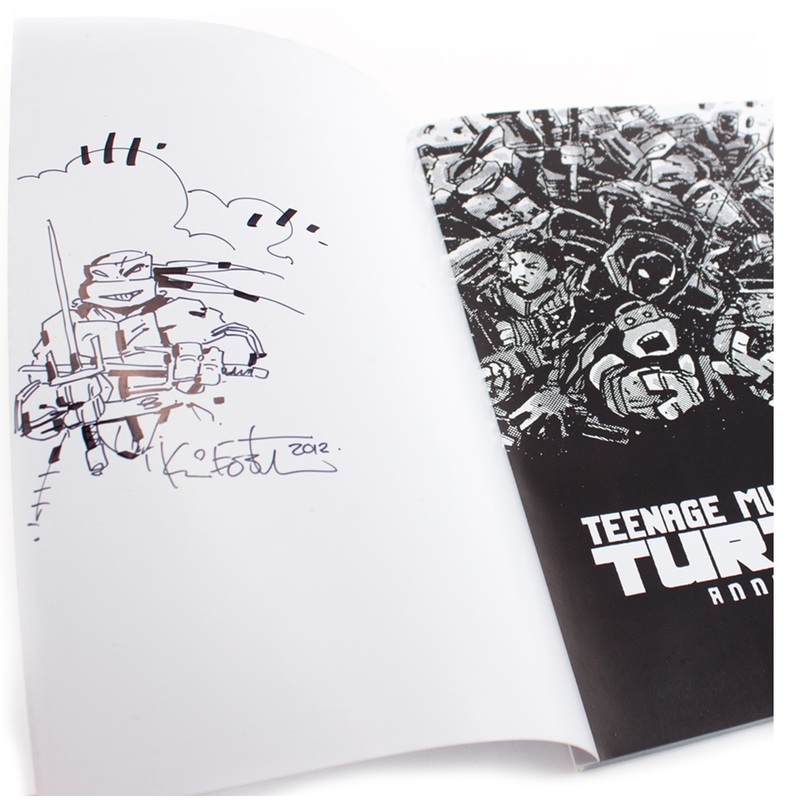 When I look back over the past year, we have launched several extraordinary limited edition books including TRANSFORMERS: IDW Collection, TMNT: Ultimate Collection, GI JOE Complete Collection, MARS ATTACKS, JUDGE DREDD collections and more. And with all of the editions, I have had the pleasure of working one-on-one with some of the best creators in the field for signatures and sketch art that are accompanied our special editions. RS: Looking back over the last year, what have been the highlights in IDW Limited's output, for you personally? 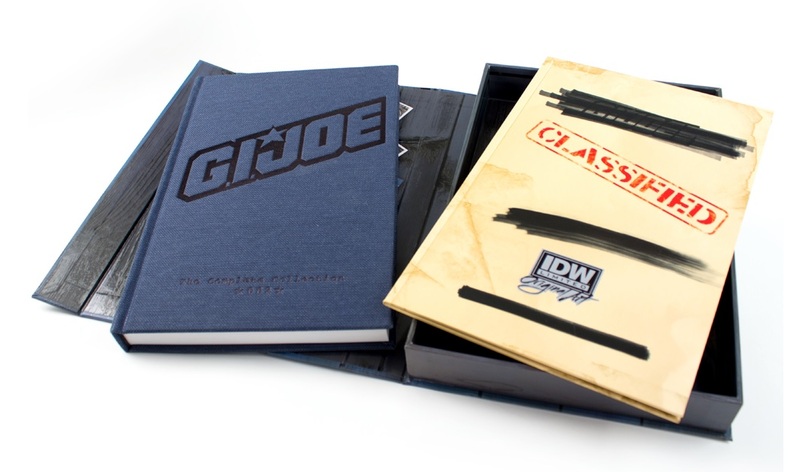 JB: Every book IDW Limited releases has some personal victory given each edition requires an extraordinary amount planning. There are two releases that I am particularly proud of: TMNT: Ultimate Collection and MARS ATTACKS. For TMNT I have the privilege of working directly with Kevin Eastman, one of the most influential comic creators in the past 30 years. His involvement with the limited edition was nothing short of extraordinary. Not only did he create original color sketch art for our special limited edition, he included hand drawn weapon sketches on the signature plates. I've been a collector of trading cards for many years and I was thrilled to work with Topps on MARS ATTACKS. Not only did our limited edition include original Mars Attacks sketch cards, everything from the special packaging to the book reinforced the core attributes of the brand: trading cards. And this product delivered it all in a big way. We landed some of the industry's best sketch card talent including Ted Dastick, Sean Pence, Charles Hall, and Nar! to name a few. All the pieces are extraordinary. NATE MURRAY (NM): The MARS ATTACKS book was an exceptional project, and it converted me into a sketch card collector. I'm already 100% addicted. To see what these artists can do in such a tiny workspace is amazing. It's a very particular skill. I have to add the JUDGE DREDD books to the list of highlights from this division. The Brian Bolland book turned out beautifully, and then extending the series into Carlos Ezquerra, the co-creator was wonderful. The original artwork that Carlos turned in for his Blue Label edition was phenomenal. RS: Of the numerous project IDW Limited have put out, were there any that were particularly tough to see through to completion or that almost didn't happen? JB: That's an easy one. The first volume of our Transformers: IDW Collection limited edition was a huge challenge. In addition to acquiring art from 6 different creators, each book was also signed by all 6 creators who reside all over the globe: US, Canada, Europe, Brazil, etc. After traveling nearly 30,000 miles the signature plates were delivered to Shane McCarthy in Australia but left on his side porch unnoticed. Fortunately his UPS driver left a note on the tracking about where the package was left and Shane found them. Close call but the plate ultimately made it home and a great product was released. NM: People really need to understand how many moving pieces there are in these books. We've got signatures and artwork coming in from every part of the globe. And this is all irreplaceable stuff. It can be tough to sleep sometimes, thinking about a shipment of hand-drawn art in transit. RS: If there's an ethos at IDW Limited, what would that be? JB: Content Is King! I say this frequently in our office. You have to strive to deliver more than just what fans have seen before. That includes original art, signatures, title page overlays, portfolios, packaging. Use the packaging as part of the content. And tie it all together so every element delivers the core essence of the brand. When all these elements are brought together, you will discover a product that delivers something special. RS: Do you have any plans to celebrate IDW Limited's first anniversary? JB: Absolutely, we are rewarding all our new and returning collector's with a massive 72-hour sale on our website the first week of October. It's our way of saying thank you to our great fans who've supported us as well as welcome new fans to be a part of this great endeavor. NM: We've lined up all kinds of fun. There's the sale, which is the only chance to get a discount, so make sure you're ready. On top of that, we'll have some new, unique items and we're working with a major creative team to launch an art contest that will be absolutely amazing if we can pull it off. The plan is to really celebrate with the fans. RS: Moving into year two, can you tease what's coming up in the next few months? Jerry: In addition to some of our core brands such as TMNT, TRANSFORMERS, and GI JOE, we have a really amazing LOCKE & KEY: HEAD GAMES Limited Edition that we've been working on for the past 6 months. this edition has a lot of surprises (literally!) as well as an incredible line up of guest talent : Tony Harris, Jim Mahfood, David Peterson, Alan Robinson and Langdon Foss, all amazingly talented creators who are each providing original sketch art that will mark their vision on this landmark inspirational series. We also have a special limited deluxe edition of STAR TREK/DOCTOR WHO which is going to blow Trek and Who fans away. Series artist JK Woodward has created of 100 black and white and full color paintings that will be packaged along with our Black and Blue Label editions. Every piece of original art he created is cover quality that fans are going to want to jump on. RS: Any personal favourites that you are particularly looking forward to? 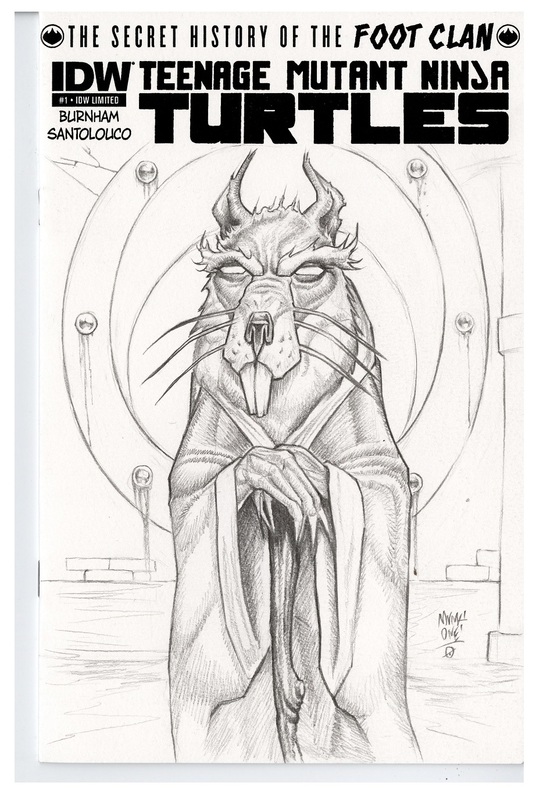 JB: For the past several months we've been developing a special limited edition TMNT: THE SECRET HISTORY OF THE FOOT CLAN. 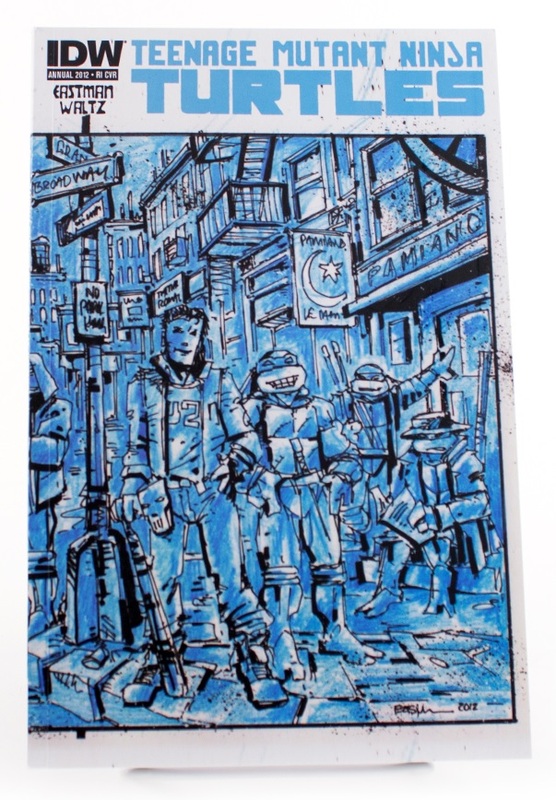 I can't reveal all the details just yet but I can say we have tapped some of the finest TMNT illustrator talents from the past, present and future. TMNT fans will undoubtedly be very impressed. NM: LOCKE & KEY: HEAD GAMES. Wait til you see what we've done. Hidden somewhere on the IDW Limited website is the AICN Logo (as seen at the top of our website). To win, the first person to TWEET a screencap of the AICN Logo to @IDWLIMITED together with the hashtag #IDWLTD1 wins the comic. The winner will be chosen by IDW and will be contacted via twitter. You can follow Russ Sheath's blog Russwords here and @russellsheath on Twitter here.